Thank you to Netgalley and Little Brown Book Group UK for my advanced reading copy of this book. 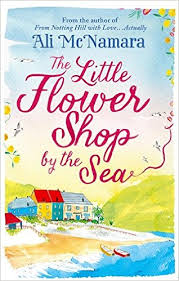 Poppy Carmichael has surprisingly inheriting her grandmother’s flower shop in the lovely seaside town of St Felix, Cornwall, a place that holds too many memories for a distraught and troubled Poppy. When she moves back to the town that she knew so well as a child she has the choice to either flee from everything that she has been avoiding here or stay and see how her path is laid out. She is determined to do her best for the sake of her adored grandmother, but she struggles with the responsibility of the more-shabby-than-chic shop. That, and her severe hatred/phobia of flowers, particularly roses. She slowly but surely learns to start trusting people and to try to come to terms with the death of her brother Will. The pretty little town has a few surprises in store for Poppy. When amber is sent to her from New York to help out in the shop their luck soon begins to change and word soon spreads about the magical shop and its healing flowers and the two soon become great friends. Jake is also a welcome distraction for Poppy, even with grief and problems of his own. Can this town and this little flower shop by the sea help poppy fight her demons once and for all? This book is written by the lovely Ali McNamara, author of From ‘Notting Hill with Love…Actually’ and is just a delight to read. I love a good chick flick and this ticked all the boxes. It was well written with believable characters, some admittedly nicer than other. I didn’t particularly like Poppy as a character but I loved Amber her sidekick. It has beach views and sea air, magical flower shops and a dream castle. Men fighting over the attention of the main character and most parts of the book fall into place exactly as you predict they will. The beach backdrop was perfect and I enjoyed the flower references and their meanings, it was a nice little bonus to the book. Parts of the book I felt could have been a little more persuasive and believable and maybe not so sickly sweet but overall this is a lovely read about new beginnings and happy endings.